Enka (Rocket) - Right as the user steps on the air itself, he/she actives the fruit's power, causing user to blast off like a rocket or cannon. Shibaku (Finger bomb) - Right after jabbing the target, the tip of the finger explodes inside the poor victim. Tekkai "SaiBaku" (Smash bomb) - Basically Tekkai Sai (used by Blueno and Kibin respectively) with the smashing fist causing the ground to explode upon contact. Shin Shigan - Basically Shigan but with the user shooting the finger limb at the target like an actual bullet. Juushigan "Kannyon" (Cannon) - After putting their hands in a Juushigan pose, the user launches their hands towards the target like a canon! Tekkai "Rain fall" - By hardening all separated parts, the user's parts will fall on the opponents in an attempt to smash them. UPDATE 11/25/18: If you want to see more DFs + Rokushiki combos that I came with so far for other devil fruits, you can find them here. As for the Miss Valentine's Kilo Kilo no mi, I decided to just condense the ideas into the doc below just avoid making this post longer and also because the I ended up coming up with more techniques for that fruit than I initially intended. In fact, this made me appreciate the fruit's potential more than ever (I still don't think it's versatility is anywhere near as good as Robin's Hana Hana fruit though). Btw, before any of you say "Why bother with the Kilo Kilo fruit when you could have done this with the Ton Ton fruit instead since it's is superior to the Kilo Kilo one. ", yes, I agree that the Ton one is superior to the Kilo one.....in Power at least. However I do believe that the Kilo one is superior to the Ton one in terms of mobility due to the obvious difference between Kilos and Tons, not to mention that both powers can only back down to 1 kilo and 1 ton respectively and nothing lighter than that, thus why I've chosen the Kilo Kilo fruit which I find easier to work with. Anyway, feel free to throw in ideas for other kinds of techniques for these combos as well as any other DFs you think I should try to combine Rokushiki with and make a small movelist out of. Last edited by shinjojin; Nov 25th '18 at 07:40 PM. Rankyaku "Buzzsaw" (LLW) - Similar to Lucci's Rankyaku Hoybi, the user goes into a flamingo stance and spins his/her leg around and around super fast at "1 kilo kilo" state before finally kicks it towards the target with the air blade being in the shape of a buzzsaw. Rankyaku "Hoshi" (Star) (LLW or LBW) - By kicking in five different directions in less than a second at the "1 kilo kilo" state, the user unleashes a large Air blade in a shape of a star. Mach Speed Kenpo (LBW) - A fighting style that allows the user to fight with lightning-fast attacks while still moving incredibly fast using Geppo, Soru, and the "1 kilo kilo" state simultaneously and continusly. This style mainly centers around elements of boxing, along with several techniques of it's own. Mach Speed Kenpo "Hokken Shu" (Cannon Fist Raid) (LBW)(H) - Part of the Mach Speed Kenpo style. The user simply uses Hokken rapidly while constantly moving around the target(s) with Soru or Senkou. Tekkai “Onochi” (Axe Hammer) (HLW)(H) - The user performs an overhead axe kick and activates Tekkai and the “Heavier weight” state in mid arc right before the leg makes contact on the target. If the target blocks the kick, the user can simply increase the pressure by making the leg heavier until he/she breaks the target’s blocking and crushes him as a result. I have to admit, I'm having a lot of fun coming up with more ideas for this fruit. However, I have yet to come up with anything new for the Bara Bara and Bomu Bomu fruits so any help with those is very much appreciated. Also, don't be shy in giving me ideas for other fruits as well. 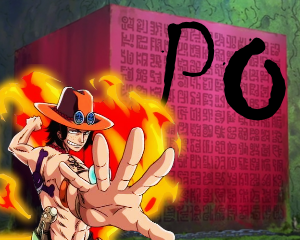 I finally got around to getting some techniques down for some of the other devil fruits that people in this forum (and other forums) have listed. There is not much at the moment but at least it's something. I have composite all of them (including the Buggy and Mr.5 ones) into a document which you can check out here. Black - Entirely new additions. Red - Techniques with updated info including names and descriptions. Tekkai "Zō" (Statue) (HBW)(H) - Basically using Tekkai “Go” (used by Blueno and Kumadori) with the user’s body being at the “10,000 Kilo kilo” state, resulting in the body becoming heavier and sturdier in order to remain in place while using Tekkai. Can be used with Busoshoku Haki “Koka” for maximum effect! Senkou (Flash) (LLW or LBW) - After making their lower body or whole body lighter than their normal weight, the user's Soru becomes much faster than usual. However, when used at the “1 kilo kilo” state, the user becomes so fast that he/she ends up surpassing the speed of sound, even to the point where even enemies with the most well trained eye will be unable to track the user’s movements, thus resulting in looking like they were instantly teleporting from place to place rather than just moving at vanishing speed. Shigan “Shiragiku” (白菊, White Chrysanthemum) (LAW)(H) - By making the arm lighter, the user's Shigan Ouren attack becomes faster! It's even possible to activate this during a regular Shigan Ouren to gradually increase the speed. Shigan "Maelstrom" (LAW)(H) - Same as the above technique but with Both arms. Kyoku Shigan “Bougan” (Extreme Shigan “Bowgun”) (LBW)(H) - A powerful Shigan technique where the user will first go into a "ready and aim" stance and then propels himself/herself straight ahead towards the enemy with Senkou (1 kilo kilo variation) and pierces the target with shigan in one instantaneous thrusting motion. Thanks to the propelling speed and power of Senkou, this shigan is so fast that it is almost virtually impossible for the enemy to react since he will be struck before he even realizes it. Kyoku Jusshigan (LAW)(H) - Same as the above technique but with all ten fingers instead of one, making it a lot more powerful. Gekko Jusshigan “?? ?” (HBW)(H) - A more powerful version of Gekko Jusshigan (originally used by Jabra) that utilizes the DF’s “Weight increasing” aspects at its maximum. It starts off with the user using Geppo to get himself/herself into the air and to subsequently avoid his/her foe's attack, then uses it again to launch themselves towards the airborne target in a vertical drop. And finally, as they’re dropping towards the target, the user immediately increases his/her weight to the “10,000 kilo kilo” state. The extra added momentum from the weight increase, along with target being vulnerable in the air, makes the following Jusshigan far more effective than a normal Gekko Juushigan, and nearly impossible to avoid. Mach Speed Kenpo "Rugokoushou" (Log stiff palm) (LBW)(H) - A high speed Palm strike with great precision. Mach Speed Kenpo "Gungnir" (LBW)(H) - A powerful and deadly hand thrust using all five fingers of the hand. Mach Speed Kenpo "Million illusion kick" (LBW)(H) - A flurry of rapid firing kicks that are near instantaneous. Geppo "Zeihō" (勢砲, Rebound Cannon) (from HBW into LBW) - This is a very risky technique that requires precise timing in order to work. In a couple of seconds before hitting the ground while falling in the "10,000 kilo kiko" state from very high up, the user immediately goes into the "1 kilo kiko" state and quickly uses geppo to bounce right back up at the very last second, resulting in a sort of a "explosive" spring or recoil effect that causes the user to skyrocket upward at speeds so intense that any rising attacks done in this state will have an incredibly more powerful impact than it normally would (like a rising fist for example). This is a very good technique for fooling people who were able to avoid any of the user's "10,000 kilo kilo" dropping smash attacks by getting high above them, only to end up being surprised at the user rebounding right back up for a counterattack from below. Not only that, but I even made a concept sketch of two of the techniques from the document with more on the way! Unfortunately, it's in cam-quality at the moment but I will post a direct scan later on. Last edited by shinjojin; Nov 20th '18 at 01:00 AM. Went ahead and added one more technique for technique to the "Kilo Kilo no mi + Rokushiki" movelist doc and it was an attack that I just couldn't resist adding in. Shozeihōken (Rising Rebound Cannon Fist) (H) - One of the follow ups to the Geppo "Zeiho" technique. Simply a powerful rising uppercut. In other words, it's pretty much the SHORYUKEN!!! 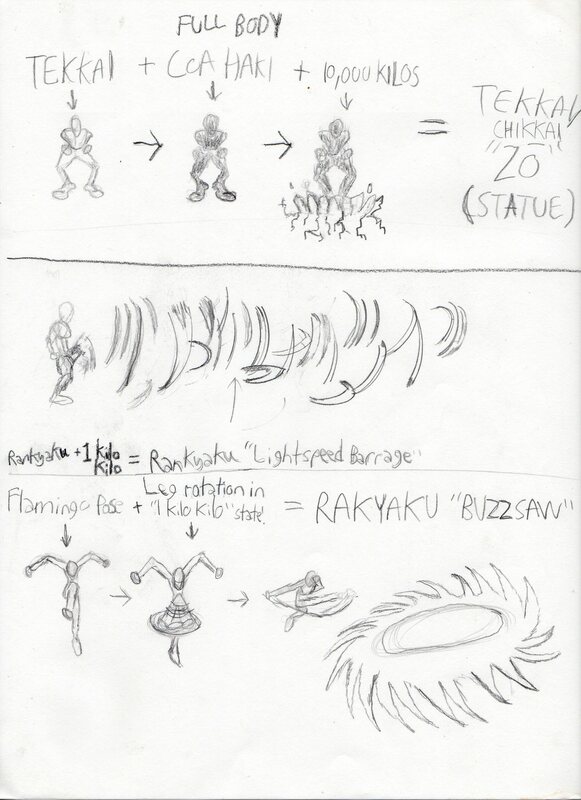 I made a direct scan of the concept sketches, plus I added a concept sketch of the Rankyaku "Buzzsaw"! Rankyaku "Shinkuro" (Synchronize) (H) - The user, with only their legs sticking out of the surface they're swimming in, unleashes different types of air blades by doing various choreographed routines that are usually shown in Synchronized Swimming. Shigan "Traveling spikes" (H) - While swimming under the surface, the user constantly unleashes a rapid-firing flurry of Shigan at the target in a similar fashion to a floor of trap spikes popping out of the ground in waves. Distortion Walk - Basically a soru + geppo technique similar to Bluewalk (the underwater technique originally used by Sanji) utilized with the DF's powers in order to travel within the surface faster. Nuff said. ??? (Buzz-saw) - The user uses both Soru and Geppou along with the fruit's flying ability to move around the air at far greater speeds. Rankayu “Bombing Run” (H) - While flying in the air, the user unleashes a barrage of raining air blades on the grounded target as they chase or circle them. Shigan “Hornet Swarm” (H) - The user unleashes a rapid-firing flurry of Shigans with all four arms. Sagan (Stinger Gun) (H) - A version of Shigan where instead of using a finger, the user uses their stinger. Kussaku Shigan (Drilling Finger gun) (H) - Using a rotating finger, the user jabs it into the target like a little drill. Kussaku Jusshigan (Drilling Ten Finger guns) (H) - The user does a Jusshigan with all ten fingers rotating like a drill. Kussaku Jusshigan “?? ?” (H) - After putting the hands into a Jusshigan pose, the user rotates both hands simultaneously (in the same direction in order to work properly btw) like big drill before thrusting into them into the enemy’s body. This technique can be even further enhanced by strengthening the fingers with Busoshoku Koka (Armament Hardening)! Geppo “?? ?” - By kicking off the air while wearing rotating pieces of cloth attach to the legs during flight, the user gains a quick boost to blast off into further distances than usual, acting sort of like an acceleration. Kussaku Shigan “Hokiri” (Cannon Drill) (H) - While heading towards the target, the user sticks out one of his/her arms and rotates both it and the finger before making contact with the target. Kussaku Gosshigan “Chou Hokiri” (Drilling Five Finger Guns “Great Cannon Drill”) (H) -Same as the above attack but with all five fingers used. Kussaku Jusshigan “Kyoku Hokiri” (Drilling Ten Finger Guns Extreme Cannon Drill) (H) -Same as the above attack but with both arms out and all Ten fingers used. Doku Rankyaku (Poisonous Storm Leg) (H) - Simply a purplish air blade engulfed in poison in order to cut and poison the enemy simultaneously. This can also be applied with universal variations of Rankyaku (ie Rankyaku Sen, Rankyaku Ran, etc.). Tekkai "Kiken” (Hazard) (H) - While Tekkai is activated, the user covers his/her whole body in invisible type of poison so that when the enemy hits the body with unarmed physical attacks (like punches and kicks for example), not only will the damage be nullified, but he will also be infected by the poison. Tobu Shigan "Venom dart" (H) - 1st version: Using the fingernails endowed with poison, the user shoots a poisoned air-compressed bullet at the target via flicking. 2nd version (HO): The user can also alternatively shoot out a poisoned shockwave compressed bullet via shooting out of the tip of the finger using Haki. Tekkai "Chou Suisai" (Great Comet Smash) (HBW)(H) - A much stronger version of Tekkai "Suisai" (Comet Smash) that is done with both fists out ahead of the user. Rankyaku “Ranhō” (Storm Cannon) (H) - Another follow up to Geppo "Zeihō". 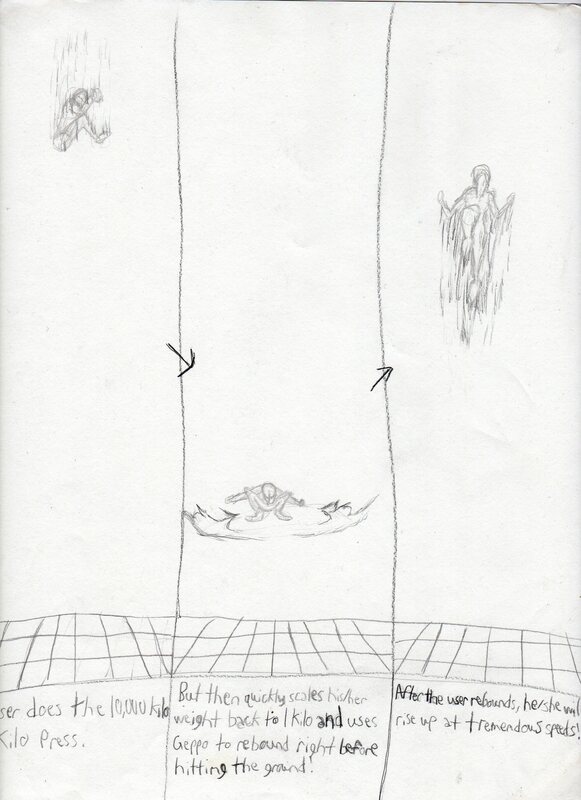 As the user is rising, the user immediately swings his/her legs upward which results in creating a tall vertical air blade that cuts anything in front of it and finally, once the user stops rising, shoots upward like a line bullet similar to Rankyaku Sen, only larger and more powerful, soaring up like a rocket. Also, I've reorganized the document a little to make it slightly better. Last edited by shinjojin; Nov 25th '18 at 09:42 PM. Soru “Shaving Spar” (H) - Using Soru to accelerate towards the target, the user then slashes the target with both bladed arms in a under-swing fashion. Soru "Tornado Spar" (H) - The user uses Soru to spin towards the target with blades on their hands, resulting in becoming like a bladed spinning top in a way. Soru "Grand Sparkling Daisy” (H) - Basically a more powerful version of Sparkling Daisy (originally used by Daz Bones) that utilizes Soru to lunge at the target at far greater speeds, thus creating a more powerful thrust. Kamisori “Zig Zag Spar” (H) - While moving through the air with Kamisori in a zigzag pattern, the user slashes the target per zip with his/her hands. Shin Rankayku (True Storm leg) (H) - While the leg(s) is in blade form, the user can unleash even sharper and deadlier air blades.This can also be applied with universal variations of Rankyaku (ie Rankyaku Sen, Rankyaku Ran, etc.). Steel Shigan (H) - Using the blades inside the finger, the user’s shigan becomes with sharper then before. Tobu Shigan "Spark bullet" (H) - Using the blades on both the thumb and Index fingers of his/her hand, the user flicks out an air bullet that is much sharped and deadlier than a usual tobu shigan. Soru “Iron Long Arm Clothesline” - After taking off one arm and holding it with the other, the user charges at the enemy with soru with the arm in hand and right before hitting the target with both arms, he/she immediately hardens both limbs with Tekkai. Bane Shigan (Spring Bullet) (H) - After turning the two first knuckles of their index finger into a spring, the user releases it and delivers an enhanced Shigan with their fingertip. Bane Tobu Shigan (Spring Flying Bullet) (HO) - The Tobu Shigan version of Bane Shigan. The user simply releases a much stronger long-range compressed air bullet. Kami-e "Spring Dodge" - When unable to avoid an attack, the user combines their abilities with kami-e and, by turning all of their limbs into springs, becomes able to bend them in such a way that they can successfully dodge the attack. Rankyaku "Spring Slash" (H) - A technique reminiscent of Rankyaku Sen. The user turns one of their legs into a spring, and then powerfully stomps the air in the direction of their opponent, causing it to be blasted in a straight line. Rankyaku "Spring Fireworks" (H) - After launching themselves high in the sky by turning their legs into springs and with geppo, the user turns their legs back to normal and unleashes tens of tiny air blades that come raining down on the enemies. Ichiman Kiro Rokuougan (10,000 kilo Six king Gun) (HHW)(H) - A incredibly powerful variation of Rokuougan where the user, right after aiming both fists downward on a target below him/her while both him and the user are in the air, makes his/her two fists go into the "10,000 Kilo kilo" state the EXACT moment (as in less than a split second) before the he/she unleashes the attack on the opponent, causing an internal shockwave that is many times greater and is so powerful that it causes a crater in the surface behind the target. This technique can be very difficult to pull off due to the exact timing of the DF activation that needs to occur in order for the technique to work properly. Gemmu or Gebbu (Moon bounce/Moon Spring) (LBW) - After lightening the body below the user’s normal weight, the user then uses Geppo in conjunction with this to jump around the air at even greater speeds, heights, and distances. HAPPY NEW YEARS!! Anyway, 13 new techniques have been added to the Kilo Kilo no mi movelist, along with some new icon indicators that are based on the Kilo-force and Kilo mass theory (this theory btw) that I came up with a while back over in various sites that Iâ€™m a member of, even going as far as revised some of the already existing techniques in the list to incorporate this theory, including an already existing variant of Rokuougan in the Rokuougan section. Now on the new techniques (the one in red is the revised Rokuougan variation that I was talking about earlier)! Kami-e â€œStringâ€� (WBM) - By making the mass of the body super light, the user can became even more floaty and paper-like than before, making it a much more superior version of Kami-e Rattle snake. GoshozeihÅ�ken (Great Rising Rebound Cannon Fist) (SAM or SHM)(H) - A far more powerful version of the ShozeihÅ�ken that revolves around scaling the mass of the arm/fist to stronger levels right before the fist connects. Shin ShozeihÅ�ken (True Rising Rebound Cannon Fist) (SAM or SHM)(HO) - The strongest version of the ShozeihÅ�ken that not only scales the mass of the arm/fist to 10,000 kilos, but also simultaneously incorporates Busoshoku Koka into the fist in order to push the power of the attack to its fullest. Grand Rankyaku (aka Rankyaku â€œHakuriâ€�) (SLM)(H) - By scaling the leg to higher mass levels (like to at least 1,000 kilos for example) right before swinging it, the user will unleash an air blade that is far larger and more powerful than a normal Rankyaku. Ultimate Rankyaku (aka Rankyaku â€œFujin no haâ€�) (LLW or LBW)(SLM)(HO) - By scaling the leg to higher mass levels (even up to 10,000 kilos) right before swinging it while the body/leg itself is in a "lighter weight" state, along with the leg being further strengthened with Busoshoku Haki, the user will unleash an air blade that is so incredibly large and powerful that itâ€™s even strong enough to cut down multiple buildings in its path, basically a far more powerful version of the Grand Rankyaku. Shigan "Magnum Chrysanthemum" (LAW)(SFM)(H) - A more powerful version of Shigan "Chrysanthemum" that incorporates Shigan Magnum to make the finger jabs stronger per strike. Makken (Mach Fist) (LAW)(H) - Similar to Tekken, only with using "Lighter weight" aspects on the arm instead of the "Stronger Mass" aspects on the fist in order to speed up the momentum, making this attack a lot faster albeit weaker (however, it's still quite powerful). It's very similar to Fukuro's Jugon since both are punching attacks are at the same speed as shigan. Chikkai "SÅ�dai ZÅ�â€� (Titanium Mass â€œGrand Statue") (HBW)(SBM)(HO) - A far more powerful (and way more risky) version of Tekkai Zo where the user scales both the weight AND mass of the entire body to 10,000 kilos while hardening the entire body with both Tekkai AND Busoshoku Haki "Koka" to create the strongest defense possible to block very powerful attacks. KadÅ�-ZÅ� Kenpo (Mobile Statue fighting style) (SBM)(H) - This is a fighting style that revolves around using powerful heavy-hitting attacks that combines the usage of Tekkai and the "mass increasing" aspects of the Kilo kilo fruit. The style itself is sort of like an alogram techniques from Muay Thai, Muay Boran, Karate, the slugger style of Boxing, and external forms of Chinese kung fu. 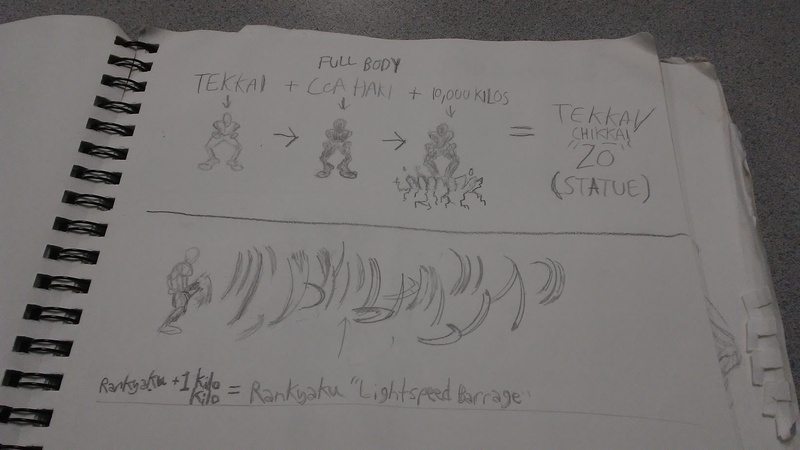 Think of this as a Kilo Kilo-exclusive upgrade to Tekkai Kenpo (originally used by Jabra in his human-wolf hybrid form) where rather than having the body being constantly hardened with tekkai the entire time while moving, the user instead has the mass of his/her body remained scaled at high levels (possibly at 1000 kilos or more) while moving and only activating tekkai and Busoshoku Haki (and immediately scaling the attacking/defending limbs to 10k or higher) when attacking or defending. Bolting Horse Statue - A technique that utilizes the leaping "Bolting Horse" attack from Muay Boran, only that both the fist and attacking knee are hardened right before the attack strikes the target. Straight Anvil Hammer - A technique based on the Straight Hammer from the Muay Boran style that is best used for parrying powerful melee attacks. Sai Dai Rin: Rokuougan (SHM)(H) - A incredibly powerful variation of Rokuougan where the user scales the mass of his/her two fists to 10,000 Kilos the EXACT moment (as in less than a split second) before he/she unleashes the attack on the opponent, causing a internal shockwave that is many times greater than a normal Rokuougan and is so powerful that it causes a large hole in the surface behind the target. The Atomic fall: Rokuougan (HHW)(SHM)(HO) - A incredibly powerful variation of Sai Dai Rin: Rokuougan where the user strengthens both arms with Busoshoku Haki and, right after aiming both fists downward on a target below him/her while both him and the user are in the air, scales both the weight AND mass of his/her two fists to 10,000 Kilos the EXACT moment (as in less than a split second) before the he/she unleashes the attack on the opponent, causing an internal shockwave that is many times greater and is so insanely powerful that it causes a crater in the surface behind the target. This technique can be very difficult to pull off due to the exact timing of the DF activation that needs to occur in order for the technique to work properly. HAPPY VALENTINE'S DAY!! Some new techniques added to the Tekkai and Kami-e sections, as well as changes having been made to some of the already-existing techniques, including ones in the Geppo. I even finally made a sketch for the Gemmu “Zeiho” technique. Kami-e "Gen" (LBW) - A variant of Kami-e that is done by making the body weigh at 1 kilo while simultaneously making the body nimble/limp in order to dodge very fast rapid firing attacks so quick that it will be like the enemy is attacking an after image, when it's simply the just the user avoiding the attacks the entire time. Kami-e "String" (WBM)(LBW) - By making the body have almost no mass and almost weightless, the user will gain insane flexibility and be able to actually look and float around like very thin piece of paper while dodging attacks. Kokkai "ShoZo" (Chromium Mass "Grand Statue") (HBW)(SBM)(HO) - A far more powerful (and way more risky) version of Tekkai Zo where the user scales both the weight AND mass of the entire body to 10,000 kilos while hardening the entire body with both Tekkai AND Busoshoku Haki "Koka" to create the strongest defense possible to block very powerful attacks. Tekkai “Chousai" (Great Smash) (HBW)(H) - Basically Tekkai Sai (originally used by Blueno and Kibin) with the "10,000 kilo kilo" state added in for an even more destructive effect! Tekkai "Seisai" (Meteor Smash) (HBW)(SBM)(H) - A much stronger version of the above attack that is done by the user scaling himself/herself to the "10,000 kilo kilo" state in both weight AND mass for a far GREATER destructive effect! Tekkai "Bai sai" (Double Smash) (HBW)(H) - Another much stronger version of Chousai that is done with both fists out ahead of the user. Tekkai “Suisai" (Comet Smash) (HBW)(SBM)(HO) - The strongest version of Chousai that is basically like Seisai but done with both fists which are both strengthened with Busoshoku/Armament haki "Koka/Hardening". I should note that the old version of "Gen" is still in the list, but its now renamed to "Gen II"
Kami-e "Ejiputo chōkoku" (Egyptian carving) (WBM)(HBW) - By shrinking the mass of the body to 1 kilo and scaling the weight to higher levels at the last moment, the user will avoid a nearly unavoidable attack by immediately laying down flat on the ground which will result in the user hilariously looking like a body figure that you see in Egyptian writings. Stone Eagle clench - Part of the Kadō-Zō Kenpo style. A clenching attack that utilizes the Eagle claw. Steel Beam kick - Part of the Kadō-Zō Kenpo style. A very powerful high side kick that is described as being hit by a large and strong beam that is used to make building structures out of. Double Steel tomahawk - Part of the Kadō-Zō Kenpo style. A powerful double arm strike where the user swings both arms sideways at both sides of the target. I was gonna make one with her doing the ShoZeihoken but it's still not finished yet. Anyway, that is all for now.